KOGA, IBARAKI PREF. - A few months before the fifth anniversary of the Fukushima No. 1 nuclear crisis, a town near the plant began removing two signs that unintentionally became ironic reminders of how Japan once blindly worshipped atomic power. A slogan above a street in Futaba town center since 1988 read “Nuclear power: the energy for a bright future.” The town is now radioactive and empty, with all of its residents evacuated. The signs are historic, but the municipality does not like them. It called them “decrepit” and decided to dismantle them because parts might fall. 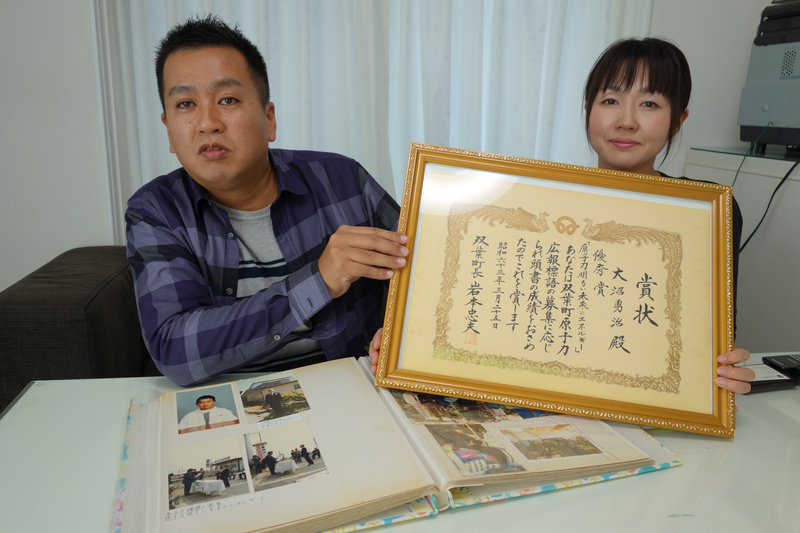 Evacuee and father-of-two Yuji Onuma regrets this. He wrote one of the slogans: It was a school homework task, and his entry won a competition. He warns the move could be perceived as an attempt to “cover up” a shameful past. “The signs should have been kept at the original places to continue reminding people, especially the younger generation, about what the town has gone through. . . . 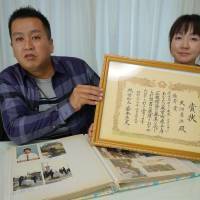 If things are removed just because it does not suit reality, we could repeat the same mistakes,” said the 39-year-old Onuma. He was speaking in Koga, Ibaraki Prefecture, where he has lived since May 2014. Onuma wrote the slogan in 1987 as part of his sixth-grade school homework. To his surprise, it won an award in a contest and was used for one of the two pro-nuclear banners set up in the town. The contest was held to encourage local support for nuclear power, the town said. Futaba was already a co-host of the six-reactor Fukushima No. 1 plant by that time, and there had been calls inside the town to bring in more units — along with the hefty subsidies offered for doing so. Onuma said even as a child he was aware of the risks of nuclear accidents. The 1986 Chernobyl catastrophe was still a fresh memory and that European ordeal fueled fears of radiation in Japan. But at the same time he had relatives working at the Fukushima No. 1 complex and knew that local inns and shopping areas were flourishing as clients such as staffers of plant operator Tokyo Electric Power Co. came and went. “There was an atmosphere of not speaking critically of nuclear power when someone next to you could be in a related job. It was a small town, with a population of about 8,000,” Onuma said. At one point he left Futaba, but returned in 2005 at the age of 29. While working for a real-estate company, he built two apartments — one just next to the signboard bearing his slogan — and rented them mainly to Tepco employees to earn additional income. The 16-meter-long sign was a source of pride. He recalls showing it to his wife, Serina, 40, and her parents when they toured the town on the day of their engagement ceremony in 2010. “I told them about the sign, which showed how people in the town lived side by side with the nuclear plant,” he said. He also told them he believed his financial future was secure with Tepco and his apartment rentals business. But his life plan was ruined by one of the world’s worst nuclear crises, triggered by the huge earthquake and tsunami on March 11, 2011. He and his wife, who was seven months pregnant at the time, fled their home. It was about 4 km from the complex. Even in the midst of the confusion, Onuma was reminded repeatedly of the sign because television and other media used it as a symbol of the town. He felt embarrassed: “The accident changed my way of thinking completely,” Onuma said, adding he thought that, in the end, nuclear power had brought a “doomed” future rather than a “bright” one. Regretting his earlier support for atomic power and in a gesture toward pulling the plug on it, Onuma began using solar power at his home in Ibaraki. He even turned it into a business by purchasing cheap land and installing over 1,000 solar panels with the help of a loan. Onuma has also taken on the de facto role of guardian of Futaba’s nuclear promotion signs after he noticed last March that they were on the verge of being dumped by the town. The municipality earmarked ¥4.1 million in the fiscal 2015 budget for their removal. Onuma organized a petition, collecting 6,502 signatures calling for this negative legacy to be preserved in the town. 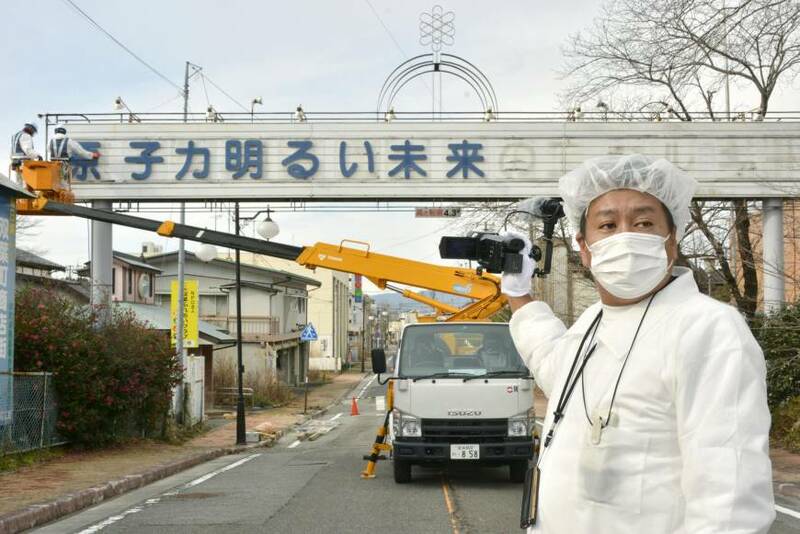 In response, Futaba Mayor Shiro Izawa maintained that the signs would be taken down but promised to “carefully preserve” them and “put them on display” again when the town recovers from the crisis. A town official said a planned disaster memorial park may be one possible location, although nothing has been decided yet. Seeing his slogan being removed from the sign in December, Onuma was disappointed that long-familiar scenery was changing before his eyes. 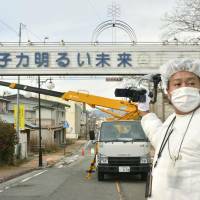 While the radiation cleanup is making progress in some parts of the town, Onuma admitted there is still no clear prospect of returning. “Buildings don’t seem to have changed much in appearance, but I’m not sure whether people can live there without worries even after the decontamination is finished,” he said.